Countdown to gender day is T-minus seven days! – Finding clothes that don’t make me look like I just won a hot dog eating contest. I love that my body is able to carry around this little muffin in it, don’t get me wrong. It’s trying to dress around the muffin that is interesting. This dress worked out for the first half of the day and it’s one I already owned, but when I got home I definitely was feeling the need to be more comfortable and less squeezed around the waist. I promptly changed into pajama shorts and a tank top. 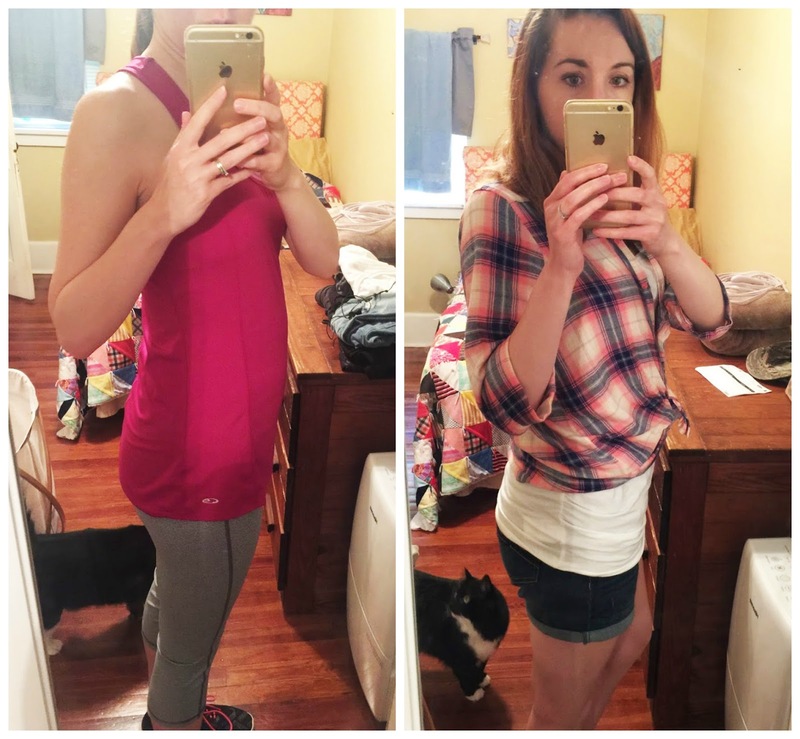 – I ordered some workout leggings from Old Navy that are comfortable, in case I want to work out. I have so far gone for one walk, for about one and a quarter miles, for reasons below. – Having a cold/allergies/whatever the heck is stuffing up my nose and sinuses while pregnant is no fun. If I want to take medicine, I have to call my doctor first, so I’m trying to guzzle lots of water. – I also found out why pregnancy and colds do not go together. Constant urge to pee + sneezing. Yep, I peed myself a little for the first time, but never say it will be the last. On the bright side, my mom ordered me these cute diapers from The Honest Company, which I got in the mail today. 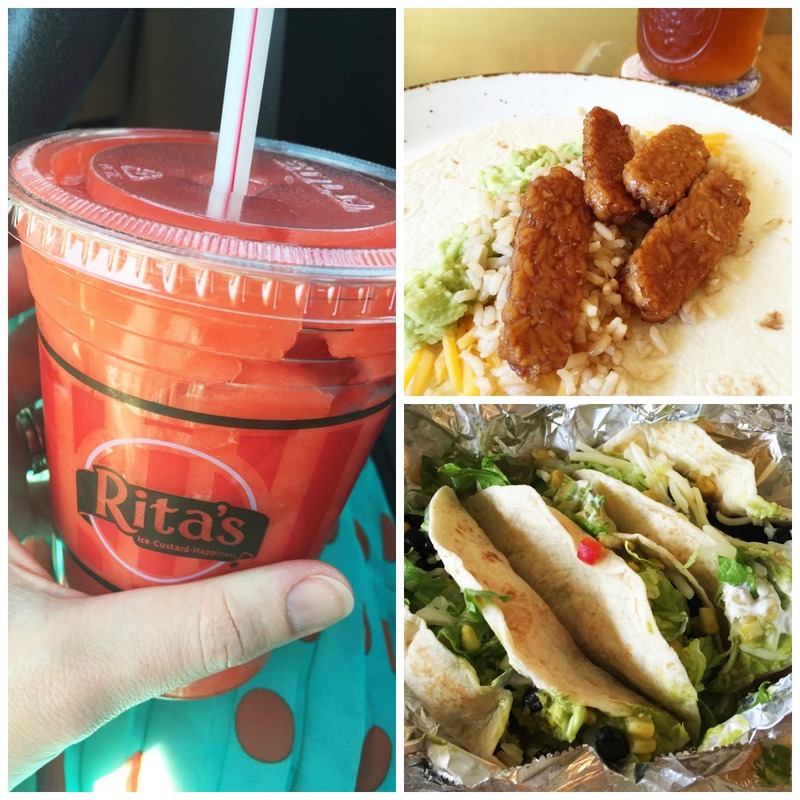 I also ate all the foods, and I might have an addiction to Rita’s. I was freaking out because I was hot and parched after shopping and suddenly wanted a Sonic slushy and then I realized there were none nearby. Then I thought of Rita’s, of course. I totally forgot that they have frozen drinks. It was perfect. I also made tempeh bacon tacos and ordered my favorite tacos this weekend. 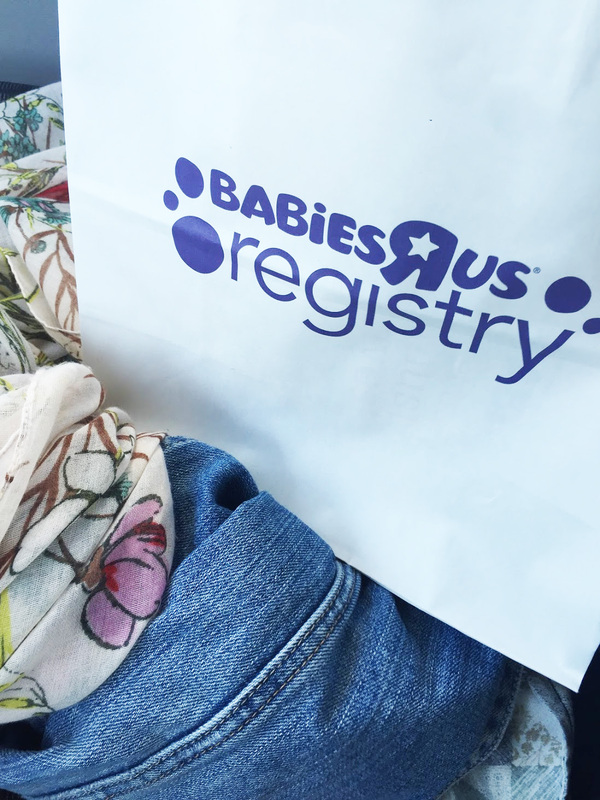 I started my registry at Babies ‘R Us, even though I was hot and grumpy and there were three ladies taking up the registry desk when I came in. I waited for them to leave, then got set up and scanned a bunch of things. I’m now registered at Target and Babies ‘R Us, and that’s all I plan on doing. I started a separate Pinterest account to help me organize my registries, since I couldn’t remember what I added and from where. I feel like there would be a need for a site that did it for you, but this way worked for me. Now, I can see everything organized by groups and decide what to add/take off. I’m going to relax and try some more to get this cold out of my head. I am wondering if/when my cats are ever going to notice the baby. So far they have made no changes and the big aka fattest one continues to try walking on belly, using it as a bridge from the window to the other side of the couch. I've heard that the biggest problem for a lot of women when they first get pregnant is trying to look pregnant instead of just like they over ate. I'm sure that you'll have a baby bump before too long! And that's awesome that you got your registering done! Those diapers are so cute!!! What made you decide to register for the travel system that you did? I am always curious as to why people picked a specific one. I can only imagine how frustrating it can be finding clothes that show you're pregnant (with a real baby, not a food baby) but honestly, you look fabulous! 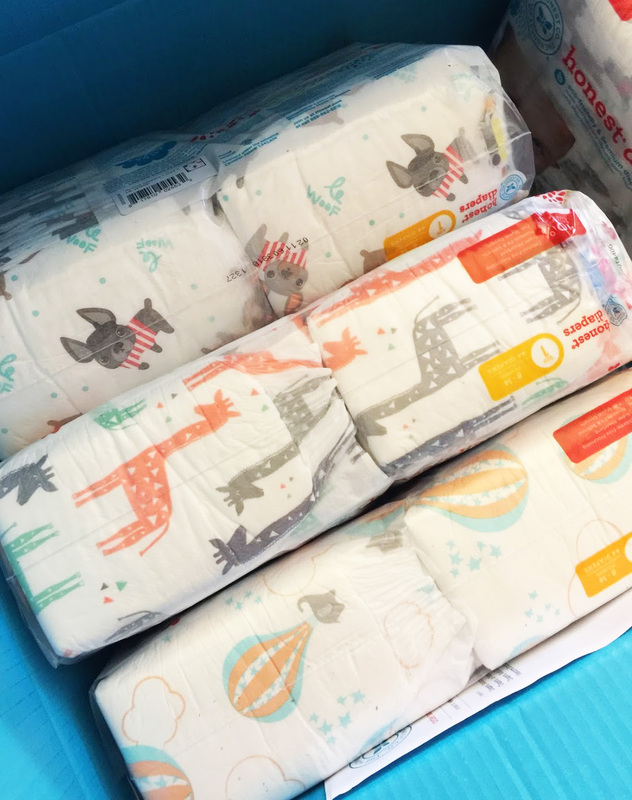 I love The Honest Co. & those diapers are so stinkin' cute!! I think Babies R Us and Target are the perfect registry places! The idea to track it on Pinterest is genius! I love Old Navy work out wear. Its so comfy & so well made for the price. oh the idea to track it on pinterest is brilliant! my belly is bigger than yours, so…. lol. that food looks amazing! So glad you got your registering done! I'm sure that's nice to have out of the way. I like your Pinterest method of keeping up with it all. 🙂 Also I hope you start feeling better soon! Thanks! Luckily, I have a few things that are easy to wear right now, but I will probably need more in the future.